seoul — ...and we're off! After a 12 hour day on wheels, wings and rails starting in Kyoto, we got off the airport bus in the heart of Seoul. Our knowledge of Korea was pretty much limited to K-town karaoke, bulgogi beef and Samsung, so we were excited to learn what the city was about. It wound up being an extremely interesting five days—everything about Seoul is intense, from the work culture to the nightlife to just walking down the street. But after a long day of travel we just wanted to get a bite to eat and get out of the cold. After a bit of trouble finding our apartment (Seoul addresses are not necessarily in order) we thawed our fingers over some post-midnight Burger King and passed out. We were staying in the busiest part of Gangnam, famous from the infamous song “Gangnam Style.” The main streets here are lined with futuristic office and apartment towers, with sidewalks full of jostling professionals. The neighboring streets are packed with bars and restaurants, stacked one on top of the other, with so many lit up signs that the street is never really dark. Further into the neighborhood are winding streets with gated houses, a rarity in Seoul. Living Gangnam Style is not cheap. Even though development of Gangnam started in the 1970s (it means “south of the river” in Korean), in some ways it’s become the center of Seoul. Samsung is headquartered here and many of the richest Koreans call it home. We were lucky enough to find a basic studio apartment here on airbnb for our five-night stay. The location was perfect—we were literally on top of Gangnam Station—and our floor-to-ceiling windows 20 stories up gave us a good view of the skyline through the smog. The first order of business the next day was to orient ourselves in the city and figure out what there was to see. Thankfully the subway system is extremely efficient here so we could hop around the sprawling metropolis for less than half of what the NYC subway costs. When we stepped down into our station we were shocked to find an entire brightly lit shopping mall underground, complete with restaurants, coffee shops and dozens of stores selling anything you might want. It was big enough to have twelve exits and the whole place was buzzing with activity. Bubblegum K-pop assaults your ears when you step into any store. This was our first glimpse of Seoul’s non-stop nature—even subway stations have every corner filled with some kind of business among the sea of people. Our first stop outside of Gangnam was in Jung-gu, an old neighborhood on the north side of the river. Stepping out of the subway was like going back from 2025 to maybe 1995. The businesses here were all small-time, independent shops and dingy-looking restaurants that no doubt served up delicious authentic Korean food. Sidewalks were full of street food stands selling all kinds of oddities such as dried octopus along with delicious sweet pastries. We even came across a big vat full of some kind of roasted bugs… we decided to pass on that. 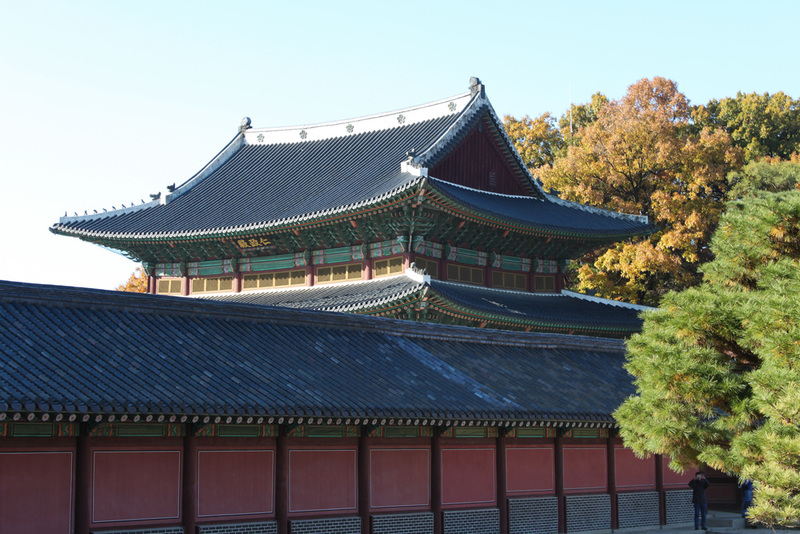 Eventually we came upon Changdeokgung, a large, ancient compound that we learned was home to Korean royalty until as recently as 1989. The traditional architecture was austere from far away but wonderfully detailed close up—we enjoyed getting an idea of what the city might have looked like centuries ago. Unfortunately the city had been burned and ravaged by war so many times that very few places like this exist in Seoul. Even these buildings were reconstructed but the grounds are preserved. In between our many walks through the city we made a point to familiarize ourselves with Korean food. We had always seen plenty of Korean restaurants around New York but it unfortunately wasn’t a staple for us. We quickly learned how big of a mistake that was. Korean food is hearty and fresh, with many interesting tastes ranging from kimchi (fermented cabbage) to big lettuce leaves full of fresh vegetables and beef strips cooked right in front of you. One of our favorite items that we’d never had before was bibim guksu, a mound of cold noodles served in an icy broth with a dollop of very spicy sauce on top. This went perfectly with small cuts of grilled beef, making for an ideal quick lunch. The best meal we had was courtesy of David, an old college friend who had moved to Seoul some years ago. He took us to a very popular bulgogi place in Gangnam where we took meat fresh off the grill and combined each bite with whatever vegetables and sauce we wanted. Delicious. We were also lucky that David speaks Korean because the restaurant was swarming with people and the waiters didn’t seem to have the time or inclination to spend more than a couple seconds dealing with foreigners. But the service is actually very efficient—every few minutes one of the wait staff was switching out the grill, bringing sauces or serving drinks. This was also the night that I first got acquainted with soju, and I will be fine if I never see it again. This evil-tasting rice liquor is the drink of choice for Koreans—it can be found everywhere from Seven Eleven to quality restaurants. A little bottle at the convenience store costs less than a buck and packs the punch of four full-strength beers. Sounds good right? It is, until you taste it. Soju tastes like some kind of polluted vodka that comes from a distillery’s side door, and it is taken neat. David knew of a trick to make it more palatable while keeping the strength by combining a highly sweetened light version with the real deal. Regardless, we all wound up drinking plenty of it and decided to keep the night going at a nearby craft beer bar David knew about. I wasn’t expecting to find this at all, and the beer turned out to be excellent. I had a strong local IPA that I’d love to see back home sometime. It was also very interesting learning a little bit from David about Korean culture. Work life is just as frantic as it looks—people work long hours and vacation is pretty much a foreign concept. It’s best to be at the office before your boss gets there and leave after he does, and if he wants to take you drinking after work then you have to get as drunk as he wants you to. With this kind of dedicated culture, it’s easy to see why Korea has grown so quickly. Still, the country is not yet at the point where the words “work-life balance” can be said with a straight face, and the children of today’s Koreans will probably have an easier life than their parents did (maybe unlike Japan). When they’re not at work or choking down soju, Koreans are usually shopping. Clothes are available almost anywhere and there is no shortage of customers. As soon as we stepped into the subway stop / shopping mall the first morning Carla was in heaven. Things are cheap here (1,000 won to the dollar says something), and Korea is so fashionable that each store is full of stuff you actually want to wear. Carla gave many stores a very thorough inspection and couldn’t help walking away with some new stuff. Seoul even has its own version of a department store, which is essentially a 6-story warehouse packed with tiny shops selling just about anything. Closing time: 5 AM. Why sleep when you can shop? When we needed to get out of the crowds, Carla and I escaped into cat and dog cafés in our neighborhood. These are what they sound like—you pay some money and walk into a coffee shop that is full of cats or dogs. It is something like a pet rental (one girl at the cat café knew most of the 40 cats’ names) but for us it was a great place to book some travel while being entertained by a small herd of animals. This is especially helpful in Seoul where there are few parks or public spaces. The last highlight of our visit was the Korean War Museum. Neither of us knew much about the events leading up to this war or how it happened, and the museum does a great job of taking you from beginning to end. South Korea’s fierce nationalism also shows through in the one-sided presentation of facts but it’s easy to understand why after learning more about the bitter fighting. There was one particularly striking re-enactment showing an all-out battle that took place 60 years ago right in the middle of Seoul. It’s hard to imagine the city was a battlefield so recently given the level of development today. 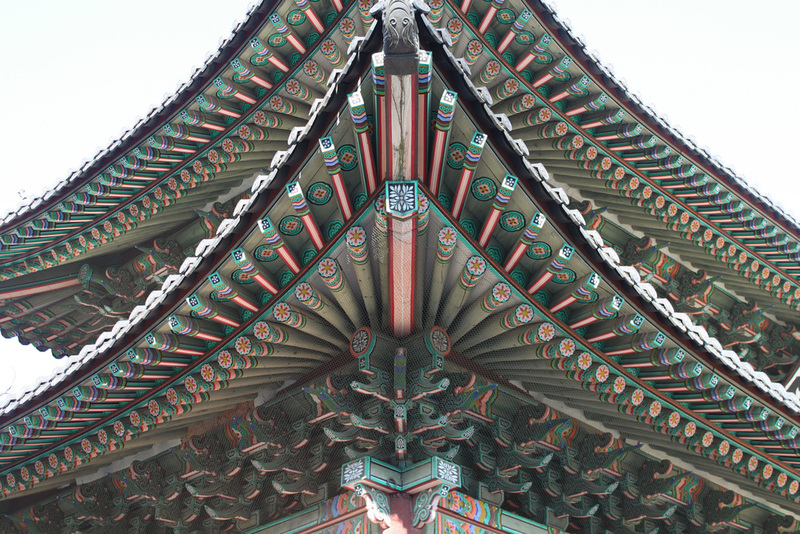 Seoul is a sprawling mass of people to rival the biggest cities in the world and it is constantly pulsing with energy. As the densest city in the developed world at double that of New York, Seoul’s 10.4 million inhabitants need to be comfortable in a crowd. There are over 20 million people in the metro area. It’s like no city we’ve ever been to but it’s closest to a younger New York, with less money, less green space, less diversity and possibly more motivation. The whimsical high-rise architecture, high-tech lifestyle and a unique brand of hyper-capitalism that has businesses or ads in every corner all suggest that other cities may look more like Seoul in the future rather than the other way around.